Arthritis is the loss of the cartilage lining the joint surface (articular cartilage). Normally this is a soft glistening smooth white tissue which acts as a bearing surface to allow the joint to move freely. If the cartilage is damaged the surface becomes rough and no longer glides. This causes pain and stiffness within the joint. The most commonly affected joints are the hip and the knee. The elbow is rarely affected. The primary cause of arthritis in the elbow is rheumatoid arthritis, condition that affects joints and organs throughout the body. Idiopathic: Arthritis of unknown cause. It may be genetic (inherited) or may be due to heavy manual work but a specific cause is usually not found. Pain is usually the first complaint and may be difficult to locate precisely. The elbow may also stiffen, the first movement to be lost is extension (straightening). As the condition progresses flexion (bending) is reduced as is the ability to fully rotate the wrist. There may be a sensation of grinding or catching within the elbow. On occasion there may be crunching which can be heard. 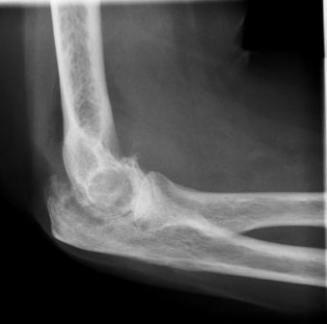 The doctor will listen to the description of the symptoms and will examine the elbow. Plain Xrays are usually sufficient to make the diagnosis. WHAT IS THE INITIAL TREATMENT? There is no cure for arthritis. If the cause is rheumatoid arthritis a rheumatologist will be involved to optimise the medications to control the condition. If one of the other causes is responsible initial treatment consists of painkillers and anti-inflammatories. Exercises to try to maintain or improve the range of motion may help. IF INITIAL TREATMENT DOESN’T WORK, WHAT’S NEXT? Corticosteroid injection into the elbow can give pain relief. The amount of benefit is variable as is the duration which may be as little as days or as long as months. Arthroscopy and debridement in which the arthroscope is introduced into the elbow and the rough cartilage is smoothed down also has variable results with benefits as variable as those seen with injection although usually longer lasting. Elbow replacement in which the arthritic elbow joint is replaced with a new one of metal and plastic give relief of pain in 90% of patients. The replacements may not give the full range of motion back. The results are not as good as for hip or knee replacement and are better for rheumatoid arthritis than for other forms. Infection: Usually less than 1%. Antibiotics are given at the time of surgery to prevent this. Nerve/ Blood vessel damage: Far less than 1%. 1/10 people will experience some tingling in the fingers for a while after surgery but this settles rapidly. Will I get more movement in the Elbow? Depending on the amount of movement before surgery, yes. In many cases, if the elbow has been very stiff before surgery, it is not possible to get all of the movement back. Will it take my pain away? 9/10 people have all or most of their pain relieved by the replacement. A small number continue to have pain despite surgery. Will I need a sling? A sling will be provided and should be worn when not doing the exercises. How will I know if is failing? Usually people start to notice either an increase in pain in the elbow or a reduction in the range of motion. The pain is often similar to the pain experienced before the joint was replaced. What can be done if it does fail? It is usually possible to replace the replacement although the surgery is more complex, the risks are greater and the results are often not as good as the first time round.